In my freshman year at Bentley I had to take an Intercultural Communication class of some sort before I was allowed to study abroad. One of our assignments was to go to Chinatown, by ourselves - walk around, make observations and for extra credit, go out to eat for dim sum. Luckily, I had 4 friends in the class and as you can guess, none of us went to Chinatown by ourselves. Seven years later I don't need a homework assignment to get me to go to Chinatown! Probably a year ago a work friend suggested we go for a girls dinner night at this highly recommended dumpling restaurant. 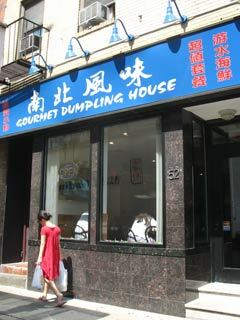 I love dumplings, so this restaurant was such a fun find. You go here for dumplings - and while I've seen other people in the restaurant order other things, I'm not sure why they aren't ordering the dumplings! When this group of old work friends was getting together again last week, we ended up at this dumpling restaurant again - so what follows here is my guide to the Gourmet Dumpling House in Boston's Chinatown! You don't just have to believe me either - Yelp fans love it too! As promised, here is one of the dishes I made using my cilantro pesto! I'm totally into these flavors now, so watch out for more recipes using the cilantro pesto! 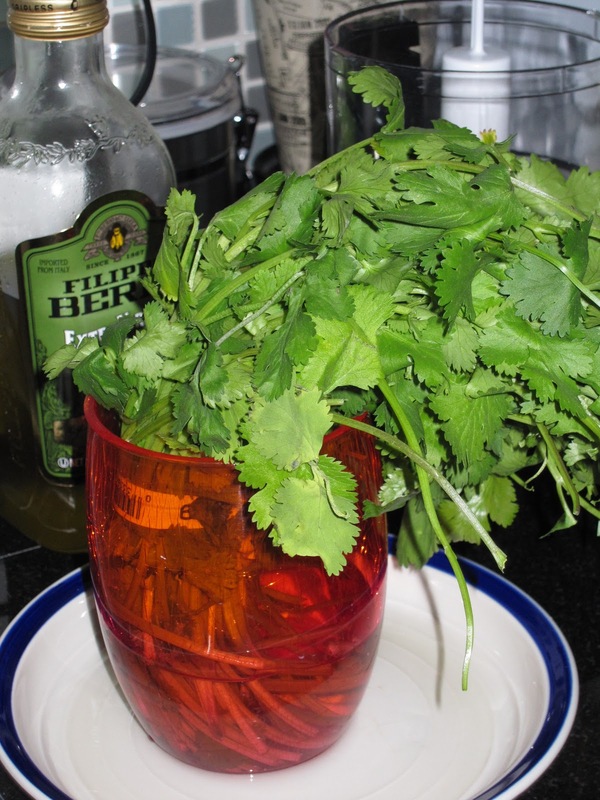 If you recently bought a bunch of fresh cilantro for a recipe, you probably also realized quickly that you used just a couple sprigs and now have an almost full bunch of fresh cilantro left. Fresh cilantro makes a big difference in a recipe so I always buy the fresh bunch when a recipe calls for it rather than using dried. Then I have to cook with cilantro all week to actually use it all up - which is pretty difficult ... until now!! I bought the bunch of cilantro originally for the Thai Peanut Noodle Salad I made with my friends last week - until I could figure out what I was going to do with the rest of the it I put the stems in a cup of water in the fridge (to help the bunch last longer). In the summer with my tons of bunches of basil I make lots of fresh pesto, and so the same thought came to mind with my cilantro. 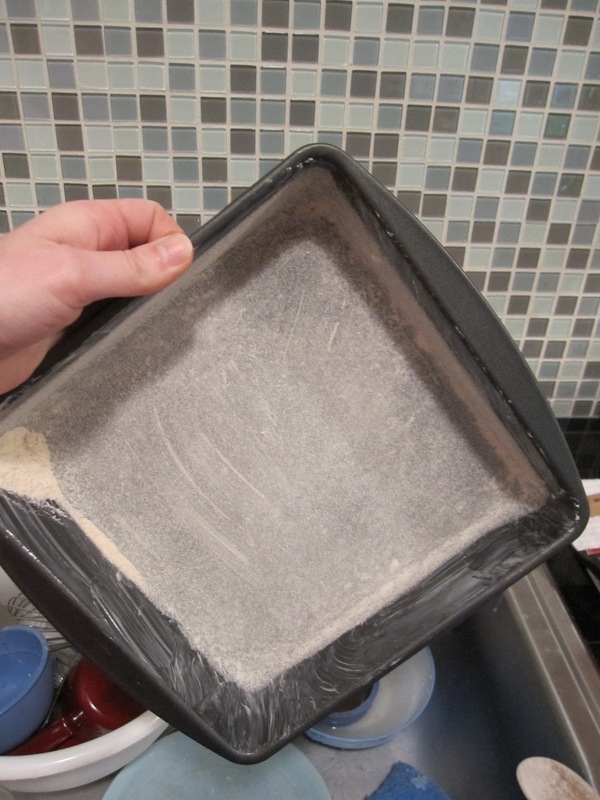 This may be my new favorite recipe idea - and it's so versatile, which makes it even better. 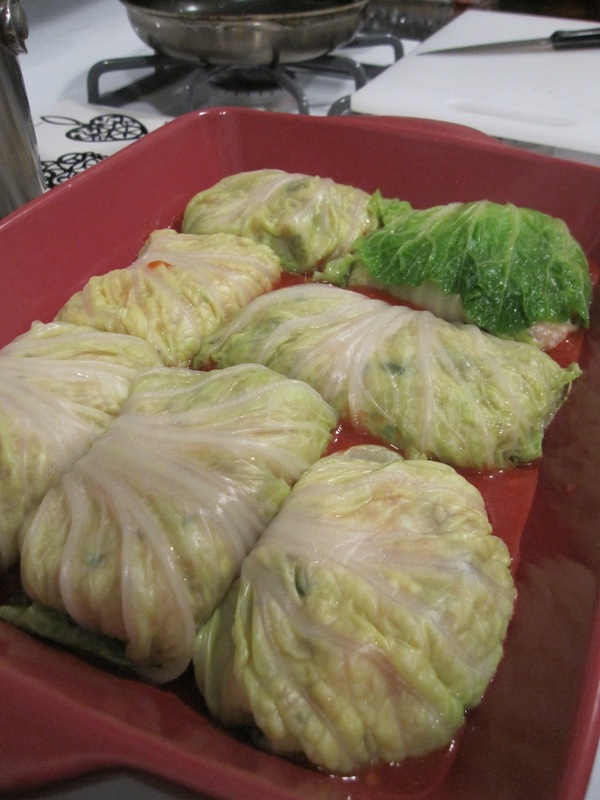 When I was on my winter break from grad school last year I made a list of recipes I wanted to try to cook - Stuffed Cabbage Rolls was on that list. 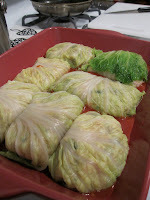 Sadly, I never made it that far down the list though and so, here I am today, finally able to say that I have made stuffed cabbage rolls! I'm not even sure I made them in the traditional manner - but my version came out quite tasty, if I may say so myself. You could easily make these with a ground pork or ground meat instead, but I liked the ground chicken. 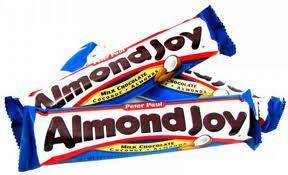 Growing up almond joys were one of my favorite candies to get when I went trick-or-treating, except that I didn't like dark chocolate and the mounds (with milk chocolate) didn't have the almond, so I could never find just what I wanted! Now that I'm a bit older I can appreciate the benefits of dark chocolate a bit more and since I don't go trick-or-treating I never have almond joys. Instead, I'll just have to make this almond joy cake! 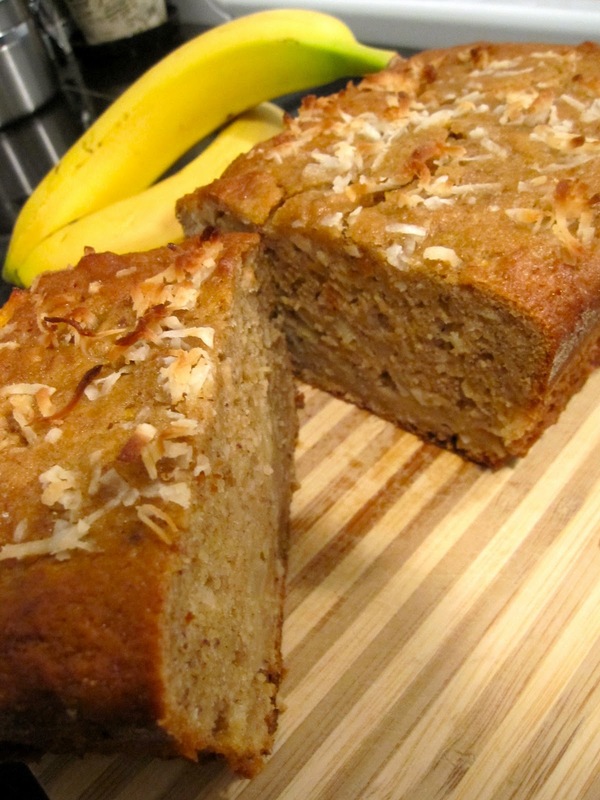 After using coconut for the banana bread this past weekend, I thought I should find another recipe to use up the rest of the shredded coconut. And this time I wasn't just baking for the heck of it. Sadly, it was for a coworkers goodbye party at work - she will be missed but I'm glad I could send her off with this yummy almond joy cake! Even though I've only had a couple entries this past week, don't you worry - I've been busy, both inside the kitchen and out. I just wanted to share a few things from this past week. If you remember, last Sunday I made a homemade tomato sauce, some of which I've put in the freezer for later and some of which I kept in the fridge for immediate use. With some mushrooms that needed to be used and a bottle of red already opened I thought this would be an easy way to make something a little more interesting than just pasta with sauce. There isn't necessarily a recipe here - but saute some sliced mushrooms in a little olive oil and garlic, and then add red wine to add some extra flavor to the tomato sauce. Mushrooms cook pretty quickly, so I wouldn't even start this part until your water is already boiling and you've added your pasta to the pot. 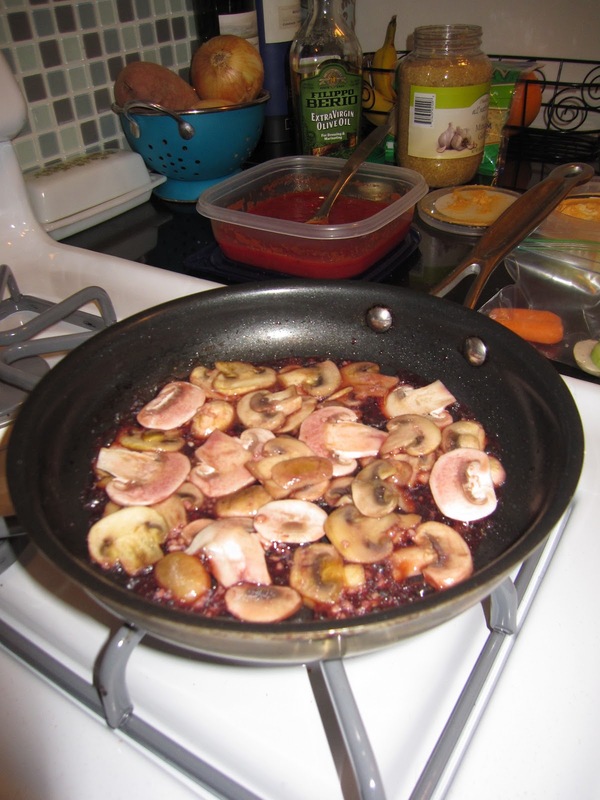 Once the mushrooms have cooked in the red wine for a couple minutes you can add some of the tomato sauce you made earlier in the week. That's right - I can't think of the last time I made a plain old banana bread. I tried making a banana apple bread once and never looked back. Now every time I have over ripe bananas I can't bear the thought of throwing them away. I found some smart advice once that suggested freezing the bananas just before they're ripe enough to use for baking - that way you can make the bread when you need it, not just when the bananas dictate they're ready to be baked! This time around I wanted to try a sort of coconut, tropical banana bread and I must say I had great success! I looked at a few different banana bread recipes and jumbled together pieces of different recipes to produce this one below, which I don't think I'd make any changes to! I noticed mangoes were on sale at Shaw's this week, which was where that idea came from. It's probably the most moist banana bread you'll ever eat - and I had so much batter I was able to make the whole loaf plus a batch of mini muffins (12). Because I took care of my St. Patty's Day green recipe quota last week with my Green Chocolate Chip Cookies, I'm all set for this week and allowed to make this thai recipe instead! I was supposed to have friends over for dinner last Friday but due to a second cold over a two week span, I had to cancel sadly. Rescheduled for last night, I was so excited to try out this recipe. A big thank you to Our Best Bites for the inspiration for this recipe, and to my friends for helping me chop all of the vegetables and for bringing some lovely wine! Some things to note: This is a big recipe - there were just 3 of us and we easily had 2 or 3 portions left. We all agreed that this would be a good picnic recipe because the combination of cabbages would hold up to the sauce and not wilt over a period of time. There's a lot of ingredients here so don't be daunted - it just takes a bit of time to get everything chopped up. If you're pressed for time you can definitely make the dressing ahead of time so you don't have to worry about that part later. I'll admit that in the occasional last minute situation I'll resort to a bottle of pre-made tomato sauce (usually from Trader Joe's), but it's definitely rare and I'll tell you why. Because making homemade tomato sauce is actually very easy! I've been using this same recipe for at least 6 years (basically since I started cooking for myself) - and my mom's been using it as long as she can remember. I think if I look back it comes from the Leone family (on my dad's side by marriage) - but either way, it's a keeper! As you can see from the title of this entry - it's a great Sunday afternoon cooking activity, and it's exactly what I did this past Sunday! Making up one big batch is perfect for me - I can keep some in the fridge and then freeze the rest in smaller portions so I don't have to make fresh sauce every time I want to cook with it (as you can see with all of my containers to the left). It's not just pasta and sauce that you can use it for either - you can use this homemade tomato sauce for an endless list of recipes: stuffed shells, lasagna, homemade pizza, soup, spaghetti and homemade meatballs, stuffed peppers, chicken/eggplant parmigiana - I could keep on going but I think you probably just want the recipe by now! I think that I could eat breakfast for all three meals of the day - it's one of my favorite meals to go out for on the weekends and I also love to make it on my own - muffins, pancakes, waffles, frittatas, scrambles. I could keep on going, but instead I'll share with you a couple reviews for breakfast places I've been to in the past couple weeks. There seems to be an endless list of breakfast and brunch places nearby - and they're not the greasy spoon type places, but rather cute cafes or restaurants with really unique menus - my favorite kind of brunch places! That's right. I made green chocolate chip cookies this week - in celebration of St. Patrick's Day (I'm a bit early). But I didn't just want to add green food coloring to a chocolate chip cookie batter - that seems like cheating to me a little so I searched around online and found this recipe online! I was a bit skeptical at first, as I'm sure you'll be too - but if I may say so myself, I think they came out quite tasty and would definitely make this recipe again, even without the St. Patrick's Day justification for green food! I would also like to point out that as I write this entry I'm sitting on my lovely new couch, while watching cable tv on my beautiful new flat screen tv, and most importantly - I'm using the internet in my own apartment and not at the Starbucks across the street! Things are finally coming together so well! They don't look as green in this picture unfortunately. One of the many perks of my new job is that I have the opportunity to attend these great lectures across the university - on a variety of, what may seem like, very random topics. The first one was a talk with the Syrian Ambassador to the US about Syria's role in bringing peace to the Middle East - very interesting and has encouraged me to work on understanding the challenges in the Middle East better. The one I had the chance to attend today was titled, "The Origins of Village Life in China: From Hunting and Gathering to Early Farming," with Professor Ofer Bar-Yosef, an Isreali Professor in the Department of Anthropology at Harvard. At first glance this may not seem related to my cooking blog - but I was so surprised to arrive at the lecture and learn all about the first developments of agriculture, found in China over 10,000 years ago! You don't need a Boiled Dinner this St. Patrick's Day! Because I found the perfect green dinner dish to make instead, and it's both easier and healthier! Whenever I see recipes I like online I send them to myself and store them in a "recipes" folder in my email account - that way if I'm in the mood to try something new I can go right to this folder and find a recipe that at one point, sounded good to me already! I invited my coworker over for dinner last night and went straight to this folder to try and find something kind of quick and light for us to make. I would also like to point out that this is the coworker that found my apartment for me - so it was fun to say thanks and show her the new place! In my wonderful folder of "recipes" I scrolled down to the oldest emails I had sent myself and found this Rachel Ray recipe that I've been wanting to make since July of 2009 apparently - "Spring Baby Artichoke and Spinach Pesto Pasta." I'm not sure if I saw her make it on one of her shows or just stumbled upon it online, but wherever I found it, I'm glad I did! As usual, I changed the recipe up a bit - so here is the link to the original in case you trust Rachel Ray more than me! At the end of my first full week at the new job I had some ground turkey I needed to use so I decided to make a good ole standby - ground turkey mexican soup. It's sort of a cross between a chicken tortilla soup and a chili - and it's fairly quick and I usually have all the ingredients on hand without having to make an extra trip to the grocery store. When my parents came down on Saturday to help me go couch shopping I was able to offer up this homemade soup for lunch! Finding a healthy chicken/turkey sausage was difficult, but I think the thin'n'trim brand makes some pretty good versions. I had a big combo pack of red and green peppers from a trip to the grocery store earlier in the week - and for one person to use 4 peppers in a week before they go bad is a challenge! I had to think of some dishes that highlighted the peppers and wouldn't just use a little bit of one of them chopped up. I also had to come up with some weeknight meals that didn't utilize a microwave (I don't have mine yet) and were pretty quick. Chicken sausage and peppers was the perfect solution! I would also like to point out that, thankfully, my smoke alarm was not set off by this meal! Sensitive Fire Alarm - suggestions please!! Okay - as I mentioned earlier, I have the world's most sensitive fire alarm in my new apartment and I'm not being dramatic here. I turned the oven on last night to preheat it to make baked sweet potato fries - at 380 degrees. I put the fries in and 3 minutes later, fire alarm started going off! The potatoes were still bright orange and hard - definitely not smoky and burnt! I'm not sure if it's sensing the heat or what, but I'm about ready to unplug it. So, given that's not the safe option for a girl living by herself - or really for anyone for that matter, I'm looking for a different solution. Any suggestions out there? 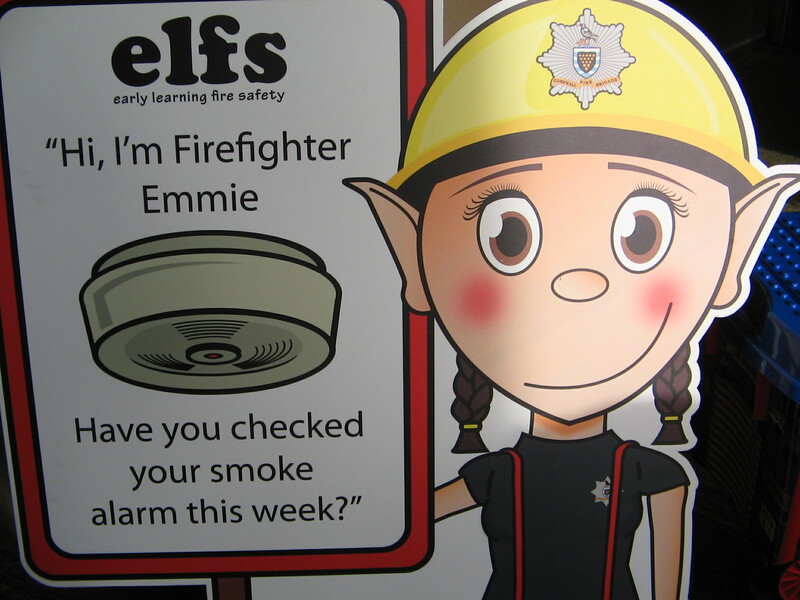 What makes a fire alarm more sensitive than another? Different brand? Are there different levels? Please help me! I cook WAY too much to be fanning the alarm every time I want to cook - plus my ceilings are high and I have to get out a step stool to even make a difference while fanning a dish towel. I would also like to point out that the alarm isn't even in the kitchen - it's over near the bedroom! I appreciate any suggestions for different alarms or ways to make it care less about my not-smoky cooking! No need to test mine, it definitely works! First Meal in the New Apt - Honey Soy Salmon! This past weekend I moved into my very first apartment living by myself! It's all very exciting, as a cook especially - because I have the entire frigde and freezer to myself! (It's the little things that excite me). A big thank you to my family for helping me move in and up the narrow stairs to my beautiful 2nd floor apartment. The entire place was just re-done - so also exciting as a cook are the brand new appliances! I'm definitely not completely unpacked, but I've unpacked the important boxes - the kitchen ones! I haven't gotten my microwave yet, so I'm sans microwave this week. On Sunday night, after moving in, I was so tired that I just wanted oatmeal for dinner so I could get to bed - I put it in my bowl, added the water and ... realized I didn't have a microwave. So I had stove-top oatmeal for dinner Sunday night - I don't count this as my first meal in my new apartment - it's too sad. Instead, my dinner on Monday night counts! First off, let me apologize for my extended absence! Between the new job, commuting from NH, moving and Comcast not showing up, I've had very little access to personal internet business! But alas - I am back! I won't have Comcast at my apartment until Saturday, but I'm making it work. This past weekend my family celebrated yet another 60th Birthday in the family - for my Uncle Fred, my dad's sister's husband. I've been wanting to make this sweet potato and chili dish for a family party for a while, so with the lingering cold temperatures I thought this would be great timing. I saw this dish on one of Rachel Ray's shows last fall as a special dish for an adult Halloween party because of it's bright orange color and hearty welcoming flavors! I've made it a few times now and each time it's come out a little different, probably as a result of my tendency to change recipes to see if I can make them better. This weekend's attempt was successful, though I think I added a bit too much tomato paste and so, the recipe below, reflects this change. As I'm sure you know by now, I don't like spicy either - so I cut way down the amount of ground chili the recipe calls for, but if you like spice - feel free to add more! I would like to note that I am not a fan of Shepherd's Pie, so do not be turned off by it's name. It's basically just a layered casserole sort of dish, with the chicken chili on the bottom, topped with the mashed sweet potato mixture and finished with some grated cheese. Yummmmy!